I'm so excited to share my latest pattern! 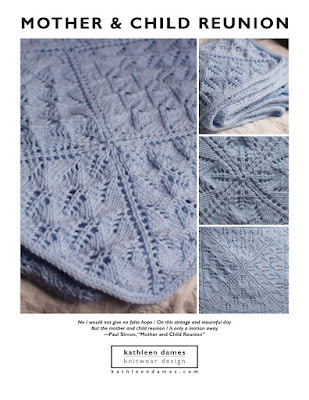 Sotherton is in the Summer 2012 issue of Jane Austen Knits, now available as a digital edition (and arriving at your LYS by the beginning of June). Sotherton is worked in-the-round from the bottom up with a round yoke and a Gothic grillwork-inspired twisted stitch pattern. Designed with negative ease and empire-style waist shaping, you can see how wildly flattering it is on the beautiful model! Madeline Tosh's tosh dk in Verdigris is the yarn, and it was lovely to use--the different shades of green with spikes of verdigris and golden sunlight is perfect. 4" of negative ease - don't fear negative ease! Check out the Ravelry page (even if you are not a member of Ravelry, I believe you can access pattern pages). 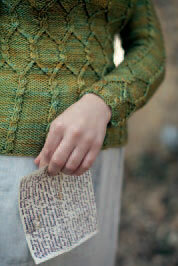 You can also pre-order your print copy here, if you can't wait for your LYS to get their copies. 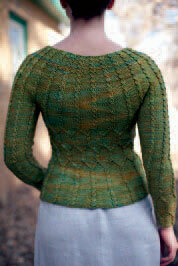 All photographs of Sotherton are © Christa Tippmann, Jane Austen Knits. LOVE this sweater, Kathleen! 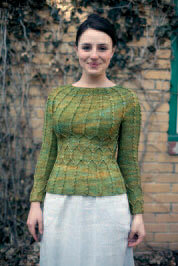 The color's great, the fit's fantastic, and the pattern work is gorgeous! WELL DONE!! OMG, this is a masterpiece. Cables are my favourite thing in the world and this is just gorgeous! And the yarn is perfect for it. "It's the best day ever!"